Stick a mini candy cane into the large marshmallow. 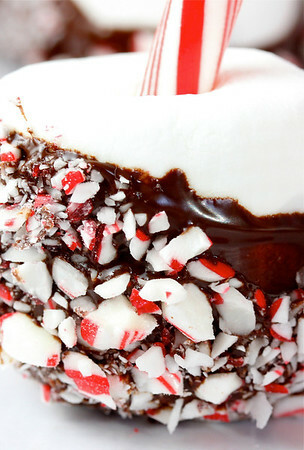 Dip the marshmallow into the melted chocolate, allow excess chocolate to drip off, then roll into the crushed candy cane. Place on a waxed paper lined baking sheet and allow to set. Liv Life Note: I found that using food handling gloves helped with this project as the candy cane can get a bit sticky. Stinkin cute! I'm snagging this idea for my son's class! I love it!!!!!! so cute, kim!!! christmas is coming too fast!!!! These are awesome! I can see sticking one (or twelve) of these in a steaming mug of booze...I mean, hot chocolate. Yum!! I feel the same this year so I understand. It will come but lately my crazy life has made it difficult to ride the holiday wave. I'm so behind it's nuts! yummy yummy...feels like a child again...I love it. Adorable and easy. Perfect for me because it's nutty around here right now! These are so cute, and festive. Getting one of the yummy treats, would certainly put you in the Holiday Spirit! Oh I just love these treats. Thanks so much Kim...just a perfect little gift. What a perfect kiddo treat! And I love that they're easy. So cute! These are soooo cute - Perfectly festive! I'm not in the spirit yet, either. It feels more like September than December around here. It's not just the weather, just an overall feeling. I'm going to put my tree up this weekend and sing cheesy Christmas songs. That usually does it. These are so cute! I love how easy they are too...what a great idea! Those are really fun--I'm sure your friends are happy to be receiving them. These are so pretty, such a great holiday gift! BEAUTIFUL!!!!! What a great gift idea!!! You are really creative, Kim!! Sweet! These pops are making me smile;-) Good luck with all your holiday preparations! Kim, These pops have to be the most adorable I've seen all season! Captivating to the eye, festive and cheery. Thank you for sharing these. What you may not be feeling in terms of holiday spirit is easily remedied - look into the eyes of the fabulous young lady you're raising...you'll find the spirit there right in front of you! I love your photographs very much. ... That close up shots are making me to grab food from the screen. I love how giftable these are. Oh, and I also think that they're PRETTY. You are so talented my friend! These look absolutely gorgeous! Love the idea. Perfect to send as presents. These are SO cute, Kim...and then you photograph them perfectly! LOVE these! Congrats on the Top 9 today! You'll have your Christmas spirit now! What a wonderful idea! I love it! So clever and looks so pretty perfect on the holiday tray! What a fantastic and simple idea all at the same time. These are definitely perfect for wrapping up all cute and giving as gifts! Thanks for the idea! Just saw this on FoodBuzz & I had to stop by. I'm still doing some last minute Christmas gifts and I'm going to make these--they are beautiful! Aw how cute are these? Love! Found them on Pinterest and making them tonight for all the kiddos on my oldest's vball team! Cute, easy, what's not to love? Thanks for sharing. So cute and absolutely perfect for the Christmas celebrations. I make these and call them Cocoa Bobbers - they are great in a cup of hot chocolate! Saw these on pinterest and think they are just adorable. You have a great blog! 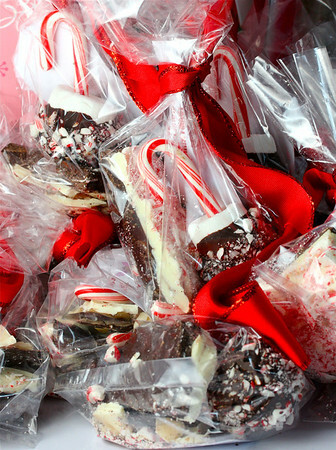 And just when I thought I'd had my fill of adorable holiday candy recipes today! Thanks for the Trader Joe's chocolate idea...that weird looking chocolate "bark" in the supermarkets just wasn't going to cut it for my attempt at candy making this year. 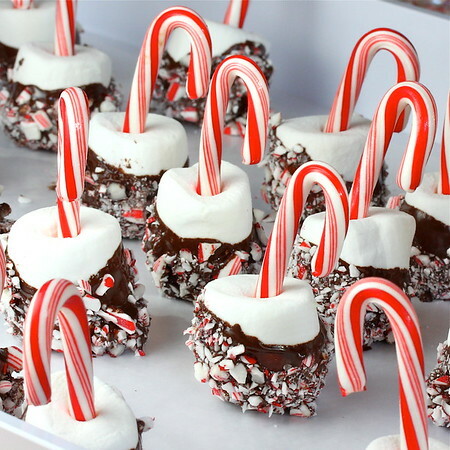 Just made these without the mini candy cane, super cute. Thanks for the idea! Jzinola! So glad you made them and that you liked them!!! Thanks for the comment! How long are these good for? I'd like to pre-make a bunch, but I wouldn't want the marshmallows going stale before Christmas! Love these and doing my own take. Will link back to you!! Thanks so much. 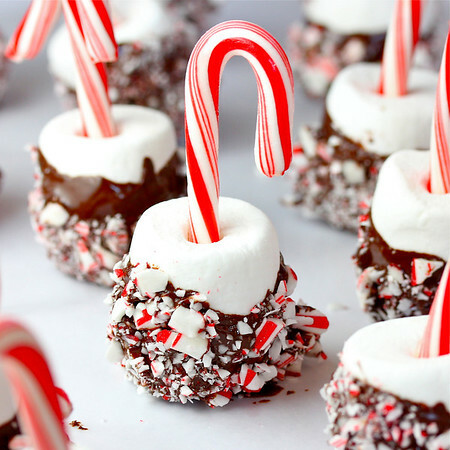 Oh these candy cane pops are gorgeous and fun for gift giving!! What a fantastic idea. Pinning immediately! These look so beautiful. How festive! I made these for my daughter's class for Christmas. They turned out so cute and were a great addition to their holiday party. Thanks for sharing! I'm so happy the kids enjoyed them!! We have had numerous requests this season too... I think they have become a tradition for us! This is such a great idea, and so easy to make with the kiddos! Thanks for sharing! Ah so fun! I'm adding these to my Christmas recipes article! Thanks for sharing!! Gave these on top of plates of cookies to my Lunch Bunch friends Yummy. These are so lovely and sound delicious. Thank you for sharing..
How much chocolate do I need to use? In some peppermint bark recipes it calls for a whole bag of chocolate chips, so I don't really know how much.